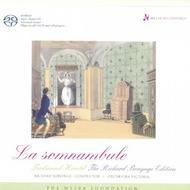 A world premiere recording of the score for perhaps the world's first full-blown Romantic ballet, Ferdinand Hérold's 'La Somnambule', written in 1827 and not heard in public for almost 150 years. This ballet music precedes Bellini's famous opera 'La Sonnambula' by four years, and its neglect is surprising, given that Richard Bonynge's deft handling of the score reveals a work which is both charming and sweetly lyrical. It is a rarity which well deserved Richard Bonynge's rescue from musical oblivion. Louis Joseph Ferdinand Hérold (1791–1833) was a French operatic composer of Alsatian descent who also wrote pieces for the piano, orchestra, and the ballet. He is best known today for the overture to the opera Zampa and the ballet La Fille Mal Gardée.